For years Phred and my Dad used to go shopping on Black Friday. 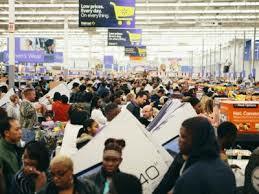 Last year several stores including WalMart began opening up late on Thanksgiving night to get a jump on the Black Friday shopping sales. Apparently it was a smashing success because many, many other stores not only followed suit, but also open even earlier on Thanksgiving day than ever before. I learned earlier this year that The Auteur, her mother and 1B have a participated in the Black Friday for years as well. For the last few weeks, The Auteur was on-again, off-again about the prospect of cutting Thanksgiving festivities short in order to score some killer deals on potential Christmas gifts. Between her Black Friday watch and our constant perusal of store sale flyers, we came to the conclusion that some of this years deals were a little too good to pass up. Things worked out pretty nicely this year. We went to LeRoy’s house for turkey dinner on Thursday and then head out to WalMart where – yes, members of the blogosphere – I took part in my first EVER Black Friday on Thursday. The Auteur got what she was looking for. Likewise, with some effort Rob’s 2013 equivalent of the Official Red Ryder Carbine Action 200 Shot Range Model Air Rifle: the XBox 360. Earlier this summer, one of The Auteur’s friends had this idea: that I should get an X Box for both The Kid and myself, get some head-phones and the XBox Live service so we can play games together via the Internet. Evidently, Jabba had the same idea and made the same suggestion. Mom & Dad have agreed to pick me up an X Box; I’ll be taking care of The Kid’s system. I was shocked at how well planned everything was at the WalMart by LeRoy’s house. Doorbuster items were set up throughout the store, with mylar baloons indicating their locations. Greeters were located at the entrances, as usual; but this time they had maps and charts with the locations of said doorbuster items. Cash register lines were grouped by threes to keep aisles as clear as possible. It was a much, much different experience than you local news or YouTube would have you believe.